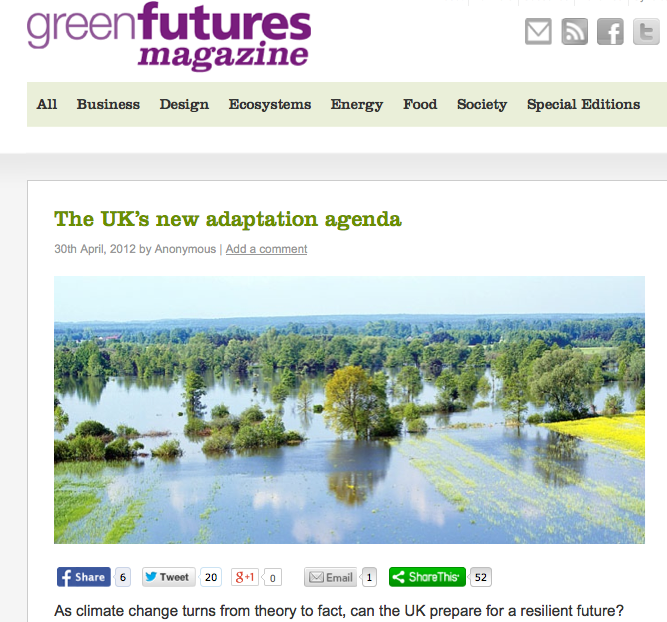 Published in Green Futures, April 2012. Original article here. As erratic weather puts increasing pressure on infrastructure, Defra’s Climate Change Risk Assessment report has provided a map to show where our efforts are needed the most. A new report that sets out how the UK is likely to be affected by climate change has paved the way for the Government to outline solutions in its National Adaptation Programme. The Climate Change Risk Assessment (CCRA) report, carried out by the Government’s Department of Environment, Food and Rural Affairs (Defra), is the most comprehensive evidence to date of how climate change will affect all aspects of our lives. While 50,000 hectares of land are currently at risk of flooding, the report projects this number to rise to 200,000 by 2080. Other risks include how higher temperatures will lead to the number of rail bucklings rising from today’s 50 to as much as 240 by 2080. Furthermore, between 27 and 59 million people in the UK will live in an area with water deficits by 2050. Threats to eleven distinctive industries, spanning from agriculture and energy to forestry and health, have been analysed in this report. Also included are biodiversity and ecosystems; business, industry and services; built environments; floods and costal erosion; marine and fisheries; transport; and water. So what should be done differently as a result of this research? This is the question at the heart of the Government’s National Adaptation Programme, which is now in the works. £2.17 billion has already been set aside for measures against flooding and coastal erosion, with other efforts already underway include guidance for local authorities on how to tackle issues such as road surface maintenance, and Network Rail’s focus on drainage and embankment stability to stay ahead of the climate change curve. But the key challenge will be to implement action across industry boundaries. “Risks are not found in isolation, meaning this represents an opportunity to collaborate,” says Barnett; the report has enabled evidence gathered by one sector to be shared with others. Take the problem of overheated buildings: the number of days averaging over 26°C could reach up to 121 by the 2080s, up from 18°C today. This has consequences for planning and design, affecting everything from homes, offices and hospitals to railways, power stations and water reservoirs. Similarly, flooding will become a problem not only for immediately related sectors such as housing and transport, but also the energy and water sectors. This became evident during the 2007 floods in England and Northern Ireland, which caused damage to power substations and water treatment works. The CCRA report has been extensively peer-reviewed, meaning it is an increasingly realistic, rather than fatalistic, picture of what will happen in the future. As the threat of climate change turns from theories to facts, the groundwork is in place for hard-hitting initiatives. Posted on 02/06/2013 by Jess. This entry was posted in Climate change and cleantech and tagged cleantech. Bookmark the permalink.